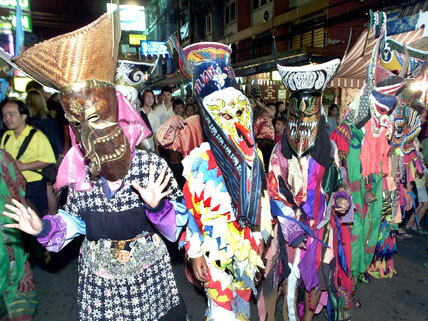 Local children in traditional masks dance with foreigners during a Halloween festival in Bangkok, Thailand. Imagine the human variety parading down any US suburban or downtown street on October 31. You’ll see everything from astronauts to zombies, with ballerinas, cowboys, ghosts, superheroes, witches, and everybody else in between. Now that’s American diversity! The human variety evident in the celebration of Halloween today reveals the varied influences on the holiday’s history. Halloween’s roots are certainly ancient, and pre-Christian observances of Celtic Europe dominate. (Celtic Europe includes Wales, Scotland, Ireland, the Isle of Man, Cornwall in southern England, and Brittany in northern France.) A Celtic holiday called Samhain fell at the end of October. On that day, the dividing line between the natural world and the “otherworld” was said to blur. Souls of the dead and spirit beings both good and evil were said to walk among the living. Christianity also shaped the holiday. All Saints’ Day (also known as “All Hallows”) on November 1 is a day for honoring saints and praying for the souls of those who have died recently. Halloween spread to America when Scottish and Irish immigrants came in waves to the United States during the 1800s. The wearing of costumes may have developed from attempts to elude angry spirits by wearing a disguise. Jack-o’-lanterns probably came from Ireland, where, since pumpkins didn’t grow there, people carved out turnips or rutabagas and placed a candle inside to light their way. Trick-or-treating may have come from Scottish children going house-to-house for fuel for a Samhain bonfire, or from poor people offering prayers for the dead in return for food. Halloween now enjoys global popularity. Across Europe, it is observed in various forms. In Hong Kong, it combines with Yue Lan, the “festival of hungry ghosts.” Japanese youth who mimic American pop culture dress up and hit the streets. In Colombia, children ask their neighbors for candy, warning those who withhold treats that their noses will grow. In some countries, though, including Australia and Brazil, Halloween is seen by many as an unwelcome American import. Watch videos about the haunted history of Halloween. Scroll down to “More to Explore” for additional history and information about Halloween in other countries. What are barmbrack, bonfire toffee, colcannon, and soul cakes? A list of Halloween foods, with links, is just one feature of this encyclopedic website. Check out this site for everything you could possibly want to know about Halloween—from costumes to music to trick-or-treating safety. For more on Celtic culture, wander through this website. The Celtic League campaigns for the political, language, cultural, and social rights of the Celtic nations. This is a awesome article! It was very interesting I have always wondered where the idea of Halloween has come from. I used this as a current event in my high school. I use this website every week for my teacher’s current event assignments. It’s an okayarticle but the writer could have done better!!! Pffff. It can stay that way Austalia!! it was pretty good. i like the history behind it. most people dont even remember this history, its all about the candy. but its really cool.